As summertime unofficially winds down, Spireon is celebrating a number of corporate milestones secured during the first half of the year. Spireon attributed product innovation, “white-glove” customer service and key industry partnerships to increases in revenue, active subscriptions and customer service metrics. “Results for the first half of 2018 show market demand remains extremely strong for our best-in-class connected vehicle solutions,” Spireon chief executive officer Kevin Weiss said. “Across the core markets we serve — auto dealerships, transportation companies and local fleets — a growing number of customers and partners are selecting Spireon based on the quality of our products and outstanding customer service. “We have made significant investments to scale the business and those investments are paying off,” Weiss continued. In the franchised dealer segment, Spireon increased Kahu device shipments by 65 percent and boosted revenues by 38 percent during the first six months of the year, compared to the same period in 2017. The company highlighted Kahu continues to attract large dealer groups for its ability to improve sales effectiveness, operational efficiency, risk management and customer service scores. In Q1, the company showcased unique capabilities of Kahu, such as advanced analytics for test drives and aging inventory, car-sharing with Drive On Demand and consumer mobile app features designed to grow service retention and add-on revenue. The significant, rapid business impact of Kahu to dealerships has gained 73 new dealer customers for Spireon in the first half of 2018. Kahu generates meaningful profit for dealers while delivering compelling consumer benefits including stolen vehicle recovery and connected car features. During the first half of the year, consumers used the Kahu app on average 11 times per month to locate their vehicle as well as set geofence and speed alerts. Spireon mentioned the Kahu app has maintained ratings of 4.6 out of 5, or higher, on both Apple and Google app stores, illustrating the high value of Kahu to car buyers. 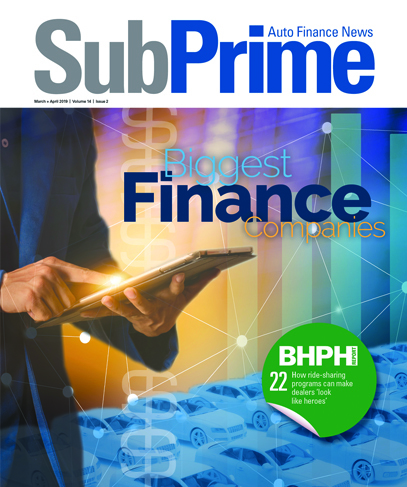 The company continues to innovate and grow market share in the subprime sector as well, with device shipments to buy-here, pay-here dealers growing 4 percent year-over-year. In June, Spireon released Quick Locate, a new feature for its GoldStar solution that can provide dealers and finance companies with instant visibility to vehicle location and status. Spireon insisted GoldStar customers remain extremely loyal, with an average customer rating of 8.9 out of 10, and 94 percent likely to recommend GoldStar, according to a TechValidate survey of BHPH dealers published in March. A leader in the trailer management space, Spireon achieved a significant milestone surpassing 200,000 trailer telematics subscribers for its FleetLocate asset and trailer intelligence solution. The rapid growth of Spireon’s market share in the trailer segment is due in part to continued innovations that streamline operations and increase profitability for customers. In the first half of 2018, the company introduced FL Flex, the industry’s first modular trailer tracker designed for mixed fleets. The compact, power-efficient tracker can be configured with a wide range of sensors, such as the new FleetLocate Cargo Sensor with patent-pending IntelliScan sensing technology, announced in early July. In the first half of this year, trailer revenues increased 36 percent versus the same span a year earlier, and Spireon secured or grew business with several notable enterprise customers including Transervices, Contract Leasing Corp. and Ryder System. Spireon’s fleet business in the small and mid-market segments also grew in with a 45-percent increase in device shipments year-over-year. • General Motors: Spireon launched their FleetLocate Connected by OnStar solution in mid-2017, enabling customers with OnStar-equipped GM vehicles to gain instant access to the FleetLocate platform without added costs or installation time associated with aftermarket devices. In the first half of this year, the company achieved 27 percent growth in activations versus the second half of 2017. • Ford Commercial Solutions: In June, Spireon partnered with Ford Commercial Solutions for FleetLocate to access data through Ford’s Transportation Mobility Cloud. As a result, fleet operators with Ford vehicles will be able to utilize FleetLocate with no aftermarket hardware required. • FleetLocate Resellers: In the first half of this year, Spireon experienced 53 percent growth in fleet channel revenue from its largest reseller partner, and a 73-percent increase in active subscriptions year-over-year. Overall, device shipments through the company’s reseller channel have increased by 39 percent. Furthermore, Spireon in August was among six companies to join Automotive Grade Linux (AGL), a collaborative cross-industry effort developing an open platform for the connected car. With the addition of these companies and organizations, the project is 130 members strong. Automotive Grade Linux is a collaborative open source project that aims to accelerate the development and adoption of a fully open software stack for the connected car. Leveraging the power and strength of Linux at its core, AGL is uniting automakers and technology companies to develop an open platform that offers OEMs complete control of the user experience so the industry can rapidly innovate where it counts. “Spireon has nearly 4 million vehicles connected to our NSpire platform, and data from more than 326 billion driving miles under our belt, so we fully understand the challenges of a fragmented telematics ecosystem that the AGL project seeks to overcome,” Spireon chief technology officer Rick Gruenhagen said. “A standardized software stack will accelerate autonomous and other connected vehicle benefits by helping solution providers like Spireon gain secure access to in-vehicle functions and data that have been locked in OEM-specific implementations until now,” Gruenhagen continued. And among other developments, Spireon improved its Net Promoter Score (NPS), a key measure of customer satisfaction and loyalty, to 71, far surpassing the industry average of 21.4 for business-to-business technology companies. Reinforcing the company’s commitment to outstanding service and support, Rashid Ismail joined the company in March as senior vice president of customer success. “The Spireon team continues to raise the bar on achieving key business metrics — whether that is devices shipped, revenue, new customers or NPS scores — which is not an easy feat when looking at the company’s substantial transformation in recent years,” Weiss said. “Our unrivaled commitment to customer service, aggressive technology roadmaps and thriving partnerships have set us up for a strong finish to 2018,” he went on to say.